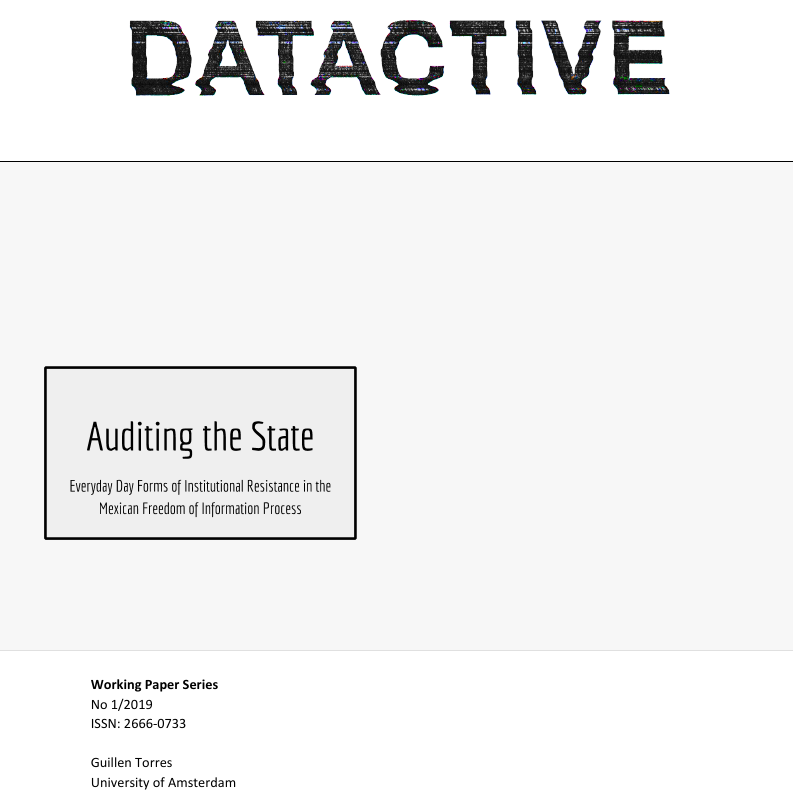 Torres, G. (2019) “Auditing the State: Everyday Day Forms of Institutional Resistance in the Mexican Freedom of Information Process”, DATACTIVE Working paper series, No 1/2019 ISSN: 2666-0733. Governmental transparency through Freedom of Information (FOI) Laws has become a standard in modern liberal democracies. However, a recent trend documented by practitioners and academics alike consists of governments stating in paper their support for transparency, but in practice implementing various kinds of strategies to limit the flow of information towards engaged citizens, increasing secrecy and opaqueness. While scholarly attention has mostly been set on the motivations and effects of secrecy within institutions, the consequences experienced by politically engaged citizens have received less interest. In this paper I focus on how information activists experience and make sense of instances of information control during the performance of the FOI process, through a case study set in Mexico. I suggest that the constant denials, delays and obstructions activists face during the process of requesting information can be productively analyzed through the concept of Everyday Forms of Resistance. The DATACTIVE Working Paper Series presents results of the DATACTIVE research project. The series aims to disseminate the results of their research to a wider audience. An editorial committee consisting of the DATACTIVE PI and Postdoctoral fellows reviews the quality of the Working Papers. The Series aims to disseminate research results in an accessible manner to a wider audience. Readers are encouraged to provide the authors with feedback and/or questions.